"People always say 'to know Justin is to love Justin!'" said Jon, Justin's father. When he was three years old, little Justin began complaining his legs hurt. Shortly thereafter, he began running high fevers. Justin's parents were very concerned and began working with a rheumatologist for what they thought was juvenile rheumatoid arthritis. Justin was given high doses of medicine to try and help the arthritis, but this only caused extreme stomach pain. A CT scan was ordered to see just where the pain was coming from when doctors discovered a tumor on Justin's left adrenal gland. Justin had stage 4 Neuroblastoma. "In a matter of seconds our lives had changed forever," said Justin's father, Jon. 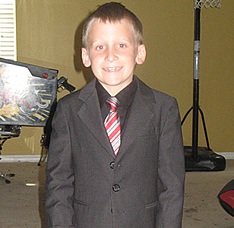 A port was inserted in Justin's chest and he began his first round of chemotherapy. "Because Neuroblastoma is rare, we searched for a doctor that primarily treats this type of cancer," explained Jon. "We left our two other sons with their aunt at home in Tampa and ventured to New York City for treatment." The NCCS helped Justin's family with travel expenses to New York and money for meals. "We don't know what we would do if we didn't have their help. I can't imagine having to choose between paying my bills and making sure my son is getting the medical care he needs," said Jon. While Justin has not reached remission, his cancer is stable and has not progressed. He is currently on a clinical trial treatment and travels to New York for blood work and scans. "The NCCS has been fabulous about paying for our flights and providing transportation and meal allowance. We don't know what we would do if we didn't have their help!" said Jon. Despite his slow progress, Justin remains a happy, bright and energetic little boy who loves all sports and does very well in school. "People always say 'to know Justin is to love Justin!'" said Jon.